Western North Carolina AIDS Project (WNCAP) handles things a bit differently, actively seeking out creativity in the community. Over time, they’ve formed partnerships that support the mission, fundraising efforts and WNCAP’s ability to highlight the impact of philanthropy on their work. WNCAP is known for its annual art auction and support of local talent for all design projects. The result is a synergy with the arts community and a distinctive brand that is presented consistently in print, online and within their facilities. 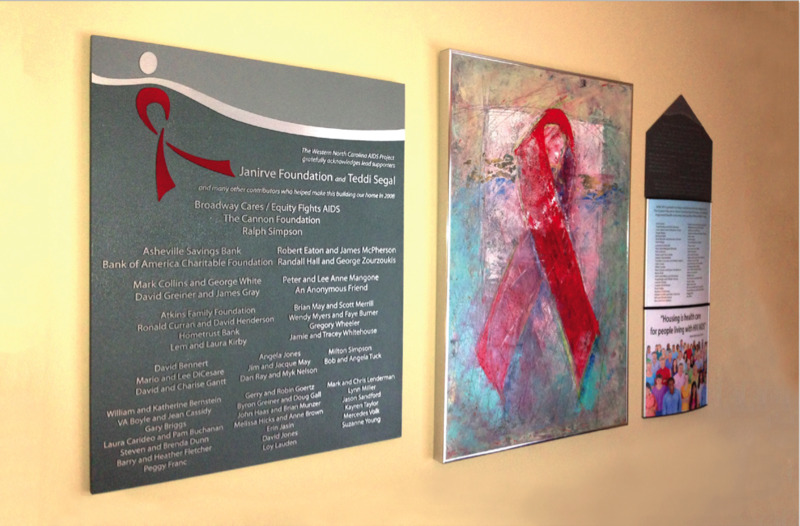 At WNCAP, the cast aluminum plaque on the left recognizes donors to the capital campaign that raised funds for a new facility for the organization in 2008. The top section of the display on the right is etched metal and lists the inaugural donors to the Curran House to Home Fund, named after WNCAP’s 2001-2011 executive director. The middle section provides a flexible space for listing the growing number of donors to the display and, when needed, the bottom section can be converted for the same purpose. This flexibility is achieved with two front-loading frames with full color prints behind clear lenses. Recently we completed a third recognition display, recognition of the Leah Karpen Innovation Fund, named after a long-time friend and supporter of the organization. Like the “House to Home” plaque, the top portion here is etched metal with two front-loading frames below. For this project, WNCAP used an illustration of the plaque to invite pledges during and annual event, garnering the majority of their gifts to the fund in commitments made that evening. Those donors are listed in the permanent metal portion of the display. Since that time, the fund has and will be promoted. Ongoing donations are listed in the printed panel at the bottom. This proactive use of donor recognition as a fundraising tool – even well before the product exists – is a strategy employed by the largest healthcare and academic institutions to build momentum and encourage greater giving. It is a concept that can be employed by organizations of all sizes if they involve a donor recognition consultant early in the fundraising process.